Our first trip to Sri Lanka and we visited all the places per plan with Salitha. He is an excellent driver who helped to keep us on schedule and transported us from place to place without a hitch but most importantly, very safely from day to night. We never knew how difficult it was to move around in Sri Lanka. 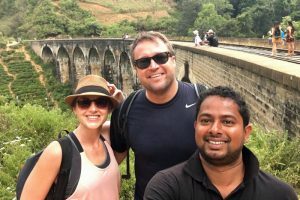 Our journey: CMB airport – Colombo – Kandy – Nuwara Eliya – Horton Plains – Hikkaduwa – Galle. There were hours and hours of driving from point to point. We did sight-seeing, hiking, scuba diving along with lots of good eats. Salitha is very patient, easy going, polite and knows his way around the island well. We will not forget the wonderful local place he took us to try many different local delicacies. Salitha made our trip much more enjoyable with no worries on how to get to the next destination.